It’s no secret that the way we live has a direct impact on the Earth. Many great improvements have been made to homes in the past 15 years to help reduce the owner’s carbon footprint and the destruction of important Earth assets. However, buyers don’t always know what features to look for when purchasing a home. So, we’ve put together a handy list of key terms. Energy Star. You’ve probably seen this a lot on appliances. It’s a way for the U.S. Government to identify electronics that meet certain standards for energy efficiency. But did you know the U.S. Energy Department also has Energy Star ratings for windows and doors, ceiling fans, and heating and cooling? By purchasing products that are Energy Star rated, you could lower your monthly utility bills significantly. LEED for Homes. U.S. Green Building Council (USGBC) has established a rating system for homes with a low energy impact called Leadership in Energy and Environmental Design (LEED). Homes and communities can receive LEED ratings. Homes can be considered Certified, Silver, Gold, and Platinum. This is based on points, with the minimum being 40. You may see this listed on a builder’s website. Certified Green Professional/Master Certified Green Professional. If you’re trying to choose a builder, renovator, or other industry professional, this is one designation that you should look for. It’s awarded by the National Association of Home Builders when an individual has completed a course or courses on incorporating green building methods at a reasonable cost. Does it mean that a builder won’t create an energy efficient home if they aren’t certified? No, but it does provide some reassurance to the home buyer. Energy Wise/ecoSelect/Optik Energy. Some local builders, like Stevens Fine Homes and H&H Homes, like to go the extra mile and have their energy efficient homes verified by an independent third party. Many of the building standards of today help to improve energy use, but builders like to go above and beyond to remain competitive. Low-Impact. Usually used in reference to the development of communities to best manage stormwater runoff and maintain water quality. It includes conserving onsite natural features like native plants and trees. If mature trees are an important feature for you, low-impact communities are a good place to look for a new home. The most recent low-impact community in the Wilmington area is River Bluffs. Sustainable Community. The exact definition of a sustainable community depends on the developer, but it’s often used in conjunction with “eco-friendly” and includes green building standards and certifications. However, sustainable communities usually take it to the next elvel by including features like community composting and recycling, rainwater barrels, natural walking trails, etc. For a local sustainable development, take a look at Tonbo Meadows, a townhome community. For more “green” terms, visit the Carolina Living glossary. Also, check out our Buyer Tips for more information on choosing home features. 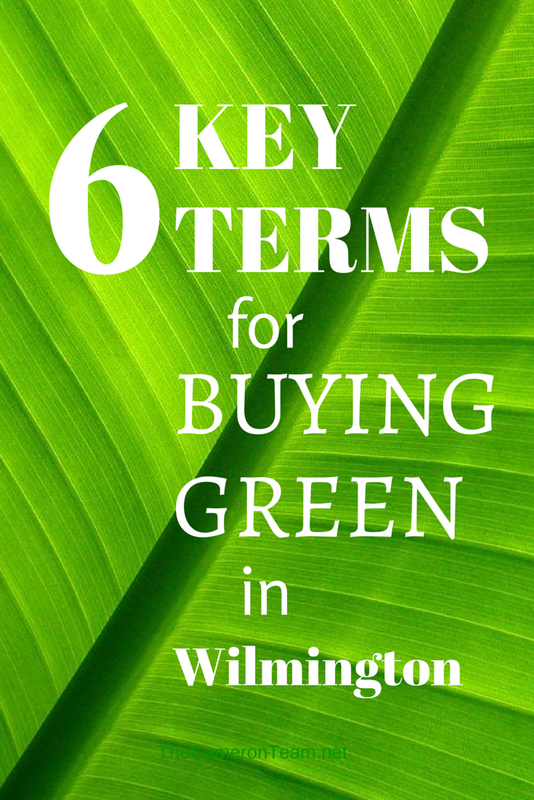 If you have any questions about buying an eco-friendly home in the Wilmington area, give us a call at (910) 202-2546 or send us a message through our Contact page. If you aren’t sure what your current home’s energy rating is, Duke Energy provides a free home audit, which could qualify you for more free services.